I wrote in past articles how the odds of a business surviving two or more generations are statistically very low. However, in Borden-Carlton, PEI we have a thriving business that is now on its third generation. In fact, The Guardian wrote about this enterprise when it was passed from the original owner, Henry Ceretti, to his son James in 1982. That article highlighted how Henry had established the business on the belief that personal attention and friendly service were more important than profit or progress. The store carried a wide variety of high-quality goods and became widely known for their fine meat products. It was also a popular place where people could just gather and know there would be friendly people to engage in conversation. The store was established in 1938 as Borden Hardware and Henry ran it for 44 years. Then his son, James, took it over and ran it until his untimely death in 2015. In 2000, James expanded their offerings to include Irving Gas and it truly became a convenient one-stop shopping location. Since his passing, the store has been run by his son, Chad, who plans to continue the traditions established by his grandfather and preserved by his father. As a child, Chad had thoughts that he might take over the business someday. He remembers getting excited about working with his father ordering, stocking, and took special pleasure in seeing satisfied customers. But after high school, Chad was not sure if running the family business was what he really wanted. So he left home and found work in the construction industry in Calgary. But when James died, Chad followed father’s dream and assumed the business. He just did not expect it to happen so suddenly. He also knows he could not have made the transition without great staff, some of whom worked with his father for many years. He realized that having good employees is the backbone and determines the long-term survival of any successful business. In many companies, clients often want to deal directly with the owner, but at Ceretti’s, customers are also comfortable dealing directly with these employees. He continually listens to his customers and now offers organic products when requested. He recently installed a roaster so customers can enjoy hot BBQ chicken, and is also considering additional meat and deli products that customers are asking for. Chad will say to anyone considering business ownership that you better to be prepared to work 12 hours a day ̶ often more. What he finds most stressful are the daily uncertainties which include; the uncertainty of not knowing if supplies will arrive on time or if they will be damaged when they do arrive. Will equipment break down overnight, spoiling thousands of dollars in goods? And, of course, will customers ultimately buy what is in stock? Chad does not do much in the way of marketing since the business is based on word-of-mouth and personal recommendations. 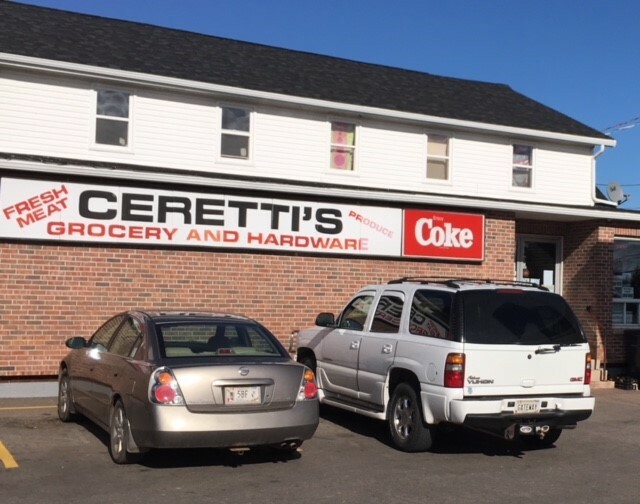 What brings people to Ceretti’s is products that compare with the larger chain grocery stores, and locals save on the expense of traveling to major cities to buy what Chad offers locally at competitive prices. Chad has not drafted his long-term plan for his establishment. But for now, he is committed to carrying on the service and traditions of his grandfather. Have you prepared your business so it can be passed on smoothly to your heirs?